If you’re able to receive notifications on your phone but not on your Watch, first try these troubleshooting steps to resolve your issue. Your Watch gets information from your iPhone via a Bluetooth connection. If you are wearing your Watch and move too far away from your iPhone, your phone will become disconnected and you won’t receive notifications or messages. To mitigate this, we strongly recommend that you carry your iPhone in your pocket at all times. When accessing the Control Panel, the phone icon should be green (as shown in the image on the left). If it isn’t green, your Watch is NOT connected to your phone and you will need to troubleshoot your connection. *For Series 3 users: As long as your Watch and iPhone have active cellular service, you won't have to carry your phone with you. Ensure Wrist Detection is deactivated. 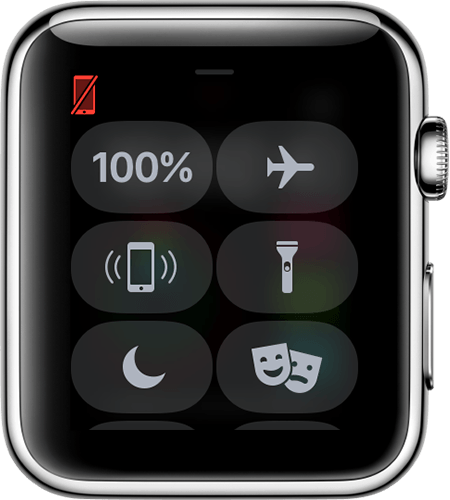 In the Watch application on your iPhone, select the My Watch tab. Make sure that the slider is set to the OFF position. to make sure that it is disabled. You can also go to Settings, tap Airplane Mode, then tap the slider to turn it off. Ensure Watch notifications are enabled for Simplifeye. Make sure the slider is set to the ON position. Tap it, then turn off Show App on Apple Watch. If you're still not able to receive notifications on your Apple Watch despite following these steps, contact us help@simplifeye.co or send us a message using chat support and we will reach out ASAP.